24-Hour Cancer Dance-A-Thon! – Swing or Nothing! 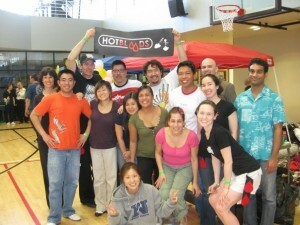 On March 14-15, 2009, I participated in the 24-Hour Cancer Dance-A-Thon in Irving, CA, dancing on a team of San Francisco Lindy Hoppers — The Hot Bloods. The Dance-a-thon is a 24 hour swing dance fundraiser, with a mission to raise money for cancer research and treatment at City of Hope Hospital. 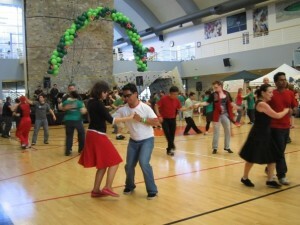 The event is like a walk-a-thon except that instead of walking, participants raise money by swing dancing! All participants, DJs, bands and instructors at the event are volunteers. This cause is especially dear to me because my mom, Eulalia Rego, passed away from ovarian cancer on January 2, 2009. All of my fundraising efforts are dedicated to her memory. Believe it or not, it was a lot of fun to be cooped up in gym with 200-300 other dancers, moving and grooving to great swing bands, DJs, taking dance lessons and more…all in the name of raising money for cancer research and treatment. The Dance-A-Thon raised a grand total of $130,453.11! 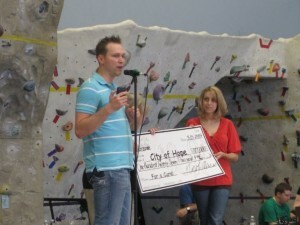 100% of that goes to the City of Hope Hospital! 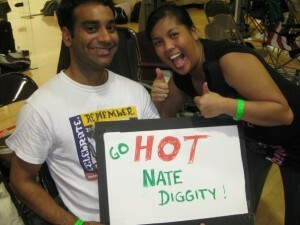 My Hot Bloods teammates and I were the 5th highest fund-raising team, bringing in a total of $7791. Not bad for our first appearance at the dance-a-thon! I was the 8th highest fundraiser, raising $1670! 45 people sponsored me with an average donation of $37.11! 32 of my sponsors were from the swing dance community, and 13 were friends and family. 6 of my sponsors were “gold” sponsors, in that they donated $100 or more. Every little bit adds up, so thank you to ALL my sponsors for your generous contributions. The Hot Bloods team, still recovering from sleep deprivation and all the dancing, has already started exchanging emails about planning for next year’s dance-a-thon. We hope you will be a part of it when the time comes, but in the meantime, here are some photos from the event. the delirious drive back after the event, waking up to find that Charlie had taken a 2 hour detour onto Highway 99 instead of Highway 5! Yikes!